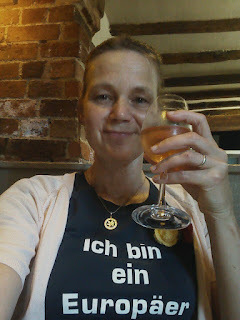 9 months ago I wrote "How I became a Brit with a German passport, and why I no longer am", just as I was considering taking more serious step towards permanent residence and eventually citizenship. My final paragraph read "It may just be that applying for British citizenship is my safest bet to ensure my future in this country. But I fear that even if I apply for and obtain citizenship, I will never feel British again in the same way I did when I was a Brit with a German passport. ", and that has definitely turned out to be the case. It is done. 16 months after I first tentatively and half-heartedly started the process, I have finally become a British citizen. Please don't congratulate me. I have all kinds of emotions, but joy and pride are not amongst them. Yes, I feel a sense of RELIEF. It secures me a future in this country and it gives me rights I have never had before. I will be able to leave Britain for any length of time without having to worry about potential changes in immigration rules. And of course I can vote! I also feel a lot of ANGER. 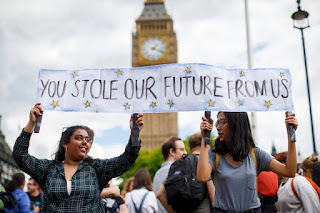 Anger for having felt forced to take this step, but also anger on behalf of all my fellow EU citizens who cannot or don't want to become British citizens and on behalf of my British friends - young and not so young - who never wanted to lose their rights as EU citizens either. I also feel a certain amount of SHAME, because I feel that I have become a British citizen for all the wrong reasons. Perhaps I had some romantic idealistic ideas of taking citizenship, but I never thought I would end up doing it out of sheer self-preservation! Many people I have spoken to have told me to just do the thing and not to worry about it, and that I was doing it for myself and no other reason. The thing is, I have taken every step with resentment. In the process of becoming a British citizen, I had to prove that I speak English and understand British culture. I have had to prove my monetary worth. They have recorded my voice, taken the biometrics of my facial features and my fingerprints. They have checked my coming and goings from this country, checked for criminal records, and have taken £1700 in the process. The final step was to swear allegiance to Queen and country - something which many of my British friends tell me they would never do. Feeling already chewed over and spat out by the Home Office, I met that final requirement too. It didn’t seem to matter any more. I promised to "be faithful to the Queen". What does that mean anyway? We weren't told, so I took it to mean that I should not attempt to seduce Prince Philip. Fair enough! I feel that Britain definitely had the best of me, and has squandered it! 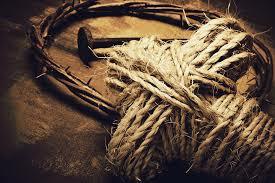 What's left of me is an bundle of anger and resentment. 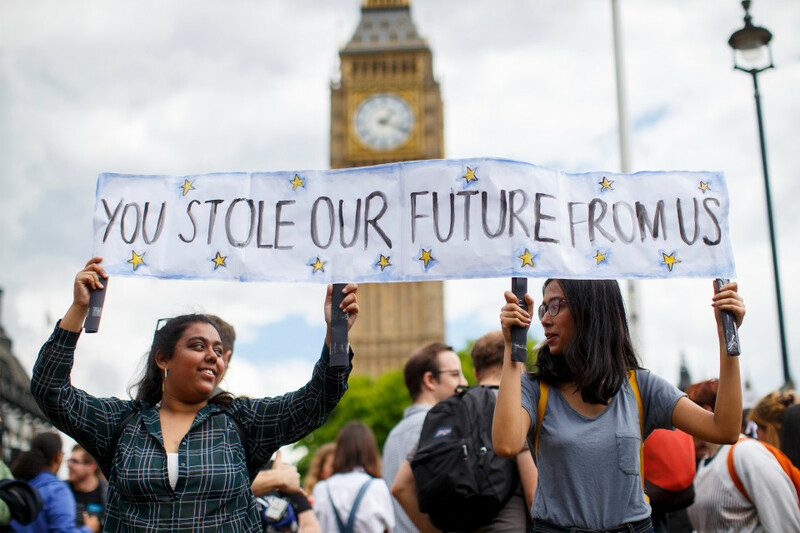 Paradoxically Brexit is creating a new breed of British citizens, and I am one of them - those EU citizens who until the EU referendum trusted the great British public to do and vote the right thing ... and who have now decided to take matters in their own hands. After the treatment they have received from the media, the government and certain groups and individuals, they are a highly politicised bunch. They will not forget how they were treated, and the lukewarm promises they got from their MPs. They will not forget which MPs and parties voted against guaranteeing their rights in this country. They will not forget the remainder of the 3 million who are still living with anxiety and uncertainty. And they will not forget that they are European first and any specific nationality second. Make no mistake, they will take an active role in shaping the future of this country! So here I am. 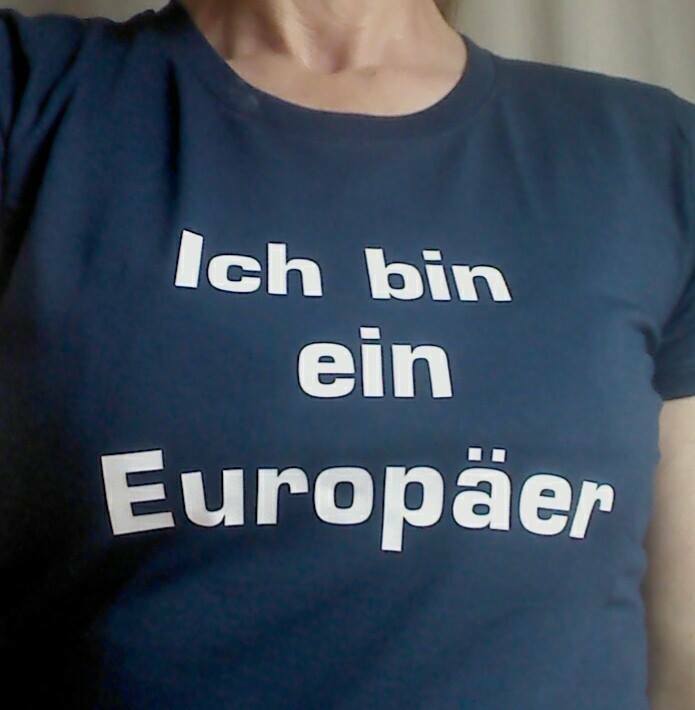 German by birth, British out of necessity and European by my identity of choice. 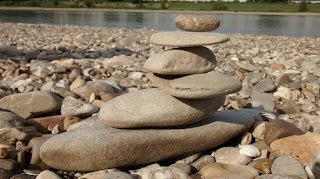 How do we create our identity? The UK has been my home for 27 years. I have always loved living here, have been part of my community and have felt totally at home and accepted. That changed a year ago when the EU referendum fuelled anti-immigration sentiment and for the very first time I felt unwelcome, anxious and insecure. I want to explain what happens when people are marginalised and scapegoated, because even a year on I feel the effects very strongly. Of course I can only speak for myself, but I have spoken to enough EU immigrants and have observed friends from other minority groups to be fairly sure that this is a shared experience. I expect that the simultaneous impact of the EU referendum result on 3 million people is probably a fairly unique event, but the sense of no longer (or indeed not ever) belonging into society happens to many groups of people for many reasons. In my personal experience, when you no longer feel accepted by society as a whole, you lose your sense of belonging and security. You may try to fight it, but how do you change society's perception of you, especially when it's fuelled by the media and political powers? You begin to feel wary of other people, and you wonder what people really think about you - even people you have known and felt safe with for a long time. You become more sensitive and more defensive about what people are saying and how they are saying it. There is a temptation to withdraw and isolate yourself, because that's easier and more comfortable than managing your own feelings around other people. So eventually you shed your old identity, and you take on a new one. Which new one? The one that you have been labelled with. First you carry that badge tentatively, then you carry it with pride. Then you start to seek others who carry the same badge, and before you know it *they* are the people you feel safe and comfortable with. And although you have perhaps never before felt disconnected from "everybody else", you have been pushed that way and you suddenly become it. You know longer belong, at least not in the same way you used to. I say this because I felt so secure and assured in my life that I would never ever have imagined that anything could change how I feel. And yet it has. If it can happen to me, it can happen to anybody. This post is not about me. I am just using my own experience to demonstrate how we affect others. How society perceives us matters. How we allow politicians and the media to speak about whole groups of people matters. If we allow people to be set aside and scapegoated we risk driving them away into the margins of society where they may become lost and drift away. We seem to be increasingly wary of people who are different to us, whether it's based on ethnicity, religion, sexual orientation, (dis)ability, or social standing etc. We don't like the very rich and the very poor. We accuse people who sound, look or behave differently to us of undermining our culture and way of life. We suspect whole groups of people of exploiting our system, to "just take" and not contribute to society. There is much talk about wanting people to "integrate", to be more like us and to take on the "British way of life". I put up a different argument. I suggest that if as a society we accept and welcome people as they are, they will be much more likely to contribute to and be part of our society naturally. It's what most people are wired to do. If we learn to draw people into the fold of our communities, rather than hold them suspiciously at arms length on the edges, we may just become a better nation. The first time I came to Britain I was 15. I came on a three week student exchange to Ramsgate in 1981. 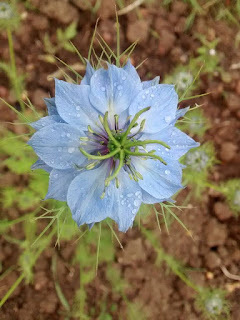 What I took back with me was the memory of rows of identical Victorian terraced houses with differently coloured doors, Royal Wedding paraphernalia, a visit to London, cheese-and-onion crisps and, oh, cream teas! The next time I came was following my A levels. I came for a year to work for a charity with learning disabled adults. I was quickly struck by the diversity in Britain which seemed to be in such a contrast to my native Germany back then. Growing up in fairly rural Germany the only non-Germans I had ever encountered were Turkish “Gastarbeiter” (guest workers), and even then they had been people I rarely actually came in contact with. They seemed to live in different places, move in different circles and go to different schools. By comparison the Britain I encountered was vibrant and diverse, with people from different nationalities and ethnic backgrounds living and working and studying together, with cultures blending and merging along the way. In short, I fell in love with the country. Incidentally, I also fell in love with an Englishman. 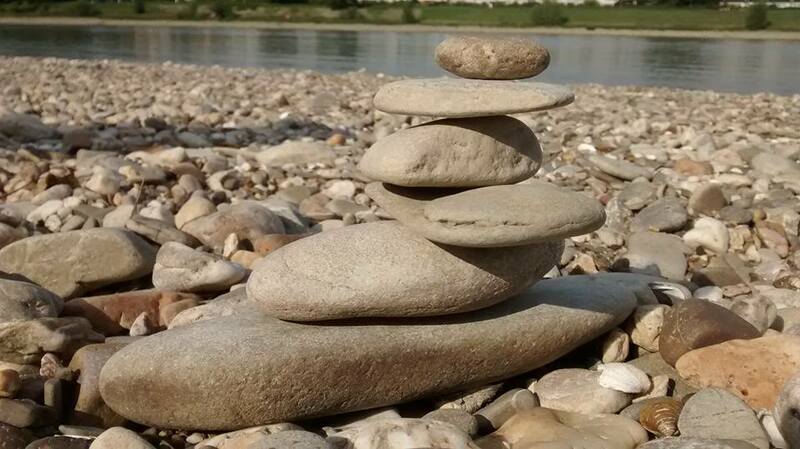 Eventually we were to get married, have two children and make our life in England – but first I returned to Germany to train as an occupational therapist. I came back to Britain newly qualified in 1990, this time to stay. I applied for three jobs and had three job offers. I started working in the NHS which I have done in a variety of settings and specialities ever since. I eagerly embraced the British way of life. I never particularly held on to my German background, upheld German traditions at home or sought contact with fellow expats from Germany. For a long time I tried to lose my accent until I finally accepted that I probably never would and that it was OK to speak English with a foreign accent. I taught my children my mother tongue, but only fairly half-heartedly. Although they now have a basic understanding of German and have visited Germany fairly regularly over the years to stay in touch with family there, they both see themselves as British more than German. In all those 26 years I never bothered applying for British citizenship. Firstly I wasn’t required to and secondly I never felt it necessary. As far as I was concerned I was already British. A Brit with a German passport! Recently things seem to be shifting. In the run-up to and during the EU Referendum campaign we started to hear from a very different Britain. Ask any German of my generation and they will probably confirm that we had it drummed into us to be vigilant against any individuals, groups or systems which try to single out minorities and outsiders to blame and scapegoat for wider problems in society, and which seek to divide society into “us” and “them”. And here we are in Britain in 2016 where the Brexit campaign has openly blamed migrants for anything from the housing crisis to unemployment and pressures on the NHS. Where groups and individuals have been emboldened to spread xenophobia and racism. Where hate crimes are on the rise. Where even in government it has become acceptable to consider forcing companies to disclose their foreign staff, and where advice from experts on EU law is not welcome if those experts don’t hold a British passport. Increasingly I find myself questioning whether this is still the Britain I so admired and fell in love with. I could do nothing and hope that common sense will prevail and I will be able to remain in this country – which seems risky and careless. 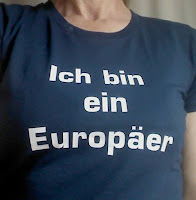 Or I could apply for British citizenship under Naturalisation, a process which is expensive, time-consuming and complicated – and which may mean I end up losing my German (and therefore European) citizenship. Or I can explore my options of returning back to Germany – which, given that I have not lived in Germany for 26 years and never worked or paid taxes there, seems an unlikely solution. It may just be that applying for British citizenship is my safest bet to ensure my future in this country. But I fear that even if I apply for and obtain citizenship, I will never feel British again in the same way I did when I was a Brit with a German passport. We have made sourdough bread on and off for years, but for the last year or so I have made it quite regularly most weeks. Here is our trusted sourdough bread recipe. It makes two 500g loaves. The first thing you have to do is make a sourdough starter. It takes a few days and is quite time consuming, but once you have the starter it's always there ready for you to use. If you look after it it will last for ages. Like I said, mine is at least a year old. 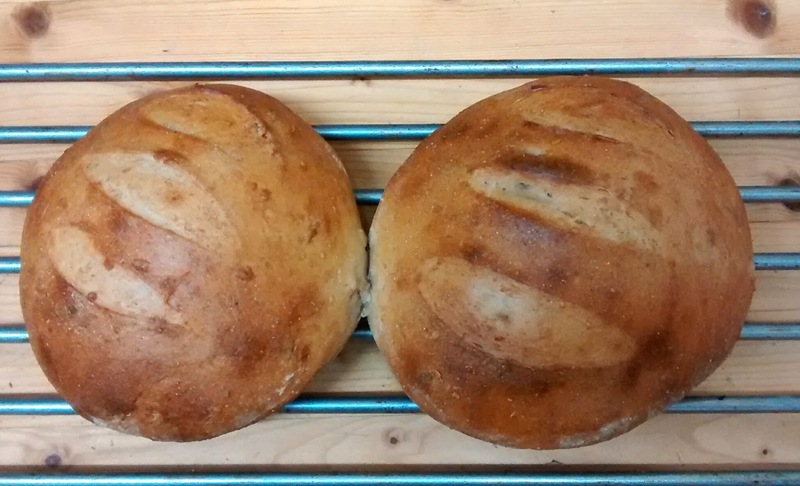 Whilst writing this blog I did some reading up about sourdough. Sourdough bread is made by the fermentation of dough using naturally-occurring lactobacilli and yeast. Sourdough bread has a mildly sour taste not present in most breads made with baker's yeast and better inherent keeping qualities than other breads, due to the lactic acid produced by the lactobacilli. 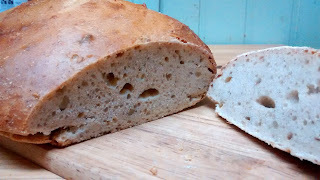 Sourdough bread is traditionally made with Rye flour, which contains relatively little gluten and therefore doesn't rise well with yeast alone. Sourdough is teeming with bugs—some 50 million yeasts and 5 billion lactobacilli bacteria in every teaspoon of starter dough. These two websites will tell you a bit more if you are interested. You keep the starter in a clean airtight container where it lives in a semi-dormant state - only to be revived when you take it out into the warmth and feed it (with flour). If you make bread regularly, that will be enough to keep it going. If you don't bake regularly, you should remember to feed your sleepy starter once a week. A teaspoon full of sugar per week is enough. 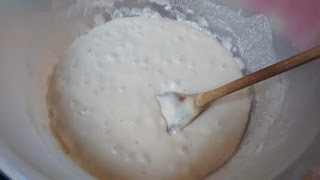 As the recipe suggests you take a cup full of the starter out of the fridge the night before you want to bake, add warm water and bread flour and leave it covered in a warm place. For this stage I tend to use white strong bread flour as I find it keeps the starter smooth and consistent. During the night the yeast and lactobacilli come to life and get moving. By morning the mix should have formed bubbles like this. Then you add the remaining ingredients. At this stage I like to dabble with different flours. In addition to the white flour I like to use rye flour. It's more expensive than wheat flour, but adds taste and texture. 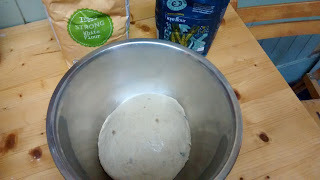 I have also tried wholemeal flour and spelt flour, and I like to add some seeds. Be aware though that different flours may react slightly differently. 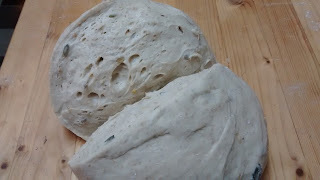 Wholemeal flour, for example, seems to absorb more water and can make the dough dry. Bear in mind that you can always add more flour, but it's difficult to add more water to an already formed dough. So keep some flour aside to add as necessary, rather than dump it all in. Knead the dough until it is elastic but not sticky. If it's sticky, sprinkle more flour onto the work surface to knead in. I have never used a mixer and always knead my bread by hand. 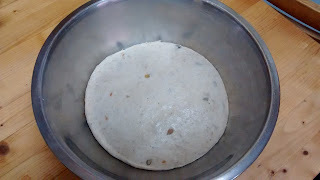 When the dough is ready, place it in a bowl, cover with cling film and leave in a warm place to rise. When the dough has risen, cut in into two halves to form into two loaves. There should be air pockets formed within the dough. Shape the loaves, cutting slashes across the top and leave to rise until doubled in size again. Then bake at gas mark 5/ 375 F/ 190 C for approximately 50 minutes or until the loaves sound hollow when tapped at the bottom. I like my crust hard, so I brush the loaves with salt and/or honey water every 10 minutes or so whilst baking. The loaves are flat, but tasty. Best with just butter I think. And please share your own thoughts, recipes and experiences.